SodaStream Source is the latest revamp of the popular at-home soda making machine many will remember from the 80's and 90's. World renowned designer Yves Behar was recruited to update the design, resulting in a more modern, user friendly device which also helps to cut down on plastic bottle waste. The operation of this unit could not be easier. You simply push the bottle opening into the mouth of the machine and lock it in. Three simple light up indicators allow you to select how much carbonation you add to the water and are activated by pushing down on the block head of the machine. A unique high pitch noise indicates the carbonation has filled the bottle which then allows you to remove the bottle by pulling it forward and removing it from the lock. The unit comes in a choice of four colours - classic black, white, blue and red. SodaStream offers a large range of flavour syrups which include classics like orange, cola, tonic and lemonade, a cocktail range, a kids juice inspired range, a clear range, two energy drink flavours, a stevia and sugar free range and an iced tea flavour. Of the flavours I tried which included cola, ginger ale, pink grapefruit and iced tea - the one thing I noted was that they were all far too sweet for my liking. SodaStream also offer a Clear range of flavours which are said to be lightly flavoured and lightly sweetened with natural plant extracts and contain no artificial sweeteners or flavours. I however did not try this range but think this would be worth a try. That said I am happy with plain mineral water with a squeeze of fresh lemon or lime. 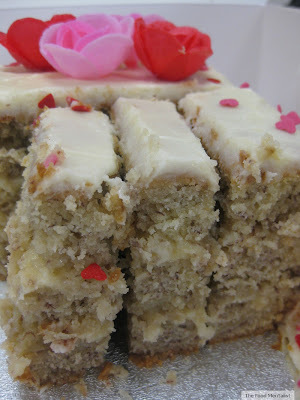 The flavours are perfect for entertaining though, particularly if you want to make cocktails. 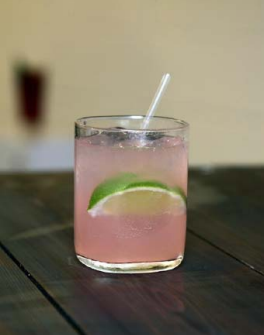 For this one I simply combined 150ml SodaStream Pink Grapefruit soda, 40ml vodka and 25ml fresh lime juice with ice. Delicious! The RRP is $149, but check online for deals or visit your closest electrical retailer or department store. 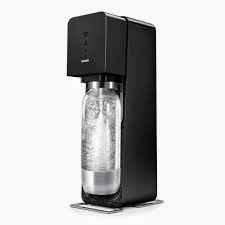 Included in the initial purchase is one SodaStream bottle, one 60L Co2 canister and a number of sample flavour pods - each make 1 litre of soda. Flavours come in 500ml bottles ($6.95-$8.95) and make 10 litres of flavoured soft drink.However, if like me you prefer your soda less sweet you could probably get 1.5 or 2 times that from each. Additional bottles are relatively cheap to purchase - 0.5 litre (2 for $14.65) or 1 litre (2 for $17.80), are BPA free and have a shelf life of about 3 years. SodaStream also operate a gas cylinder exchange program which helps to keep the cost of replacement canisters down and reduces waste. The best thing about SodaStream Source is that we now have sparkling water at our fingertips and no longer have to lug heavy bottles of soda and mineral water from the supermarket - not to mention the reduction of plastic waste going into our recycling each week. I also love the modern design and its super easy to use. 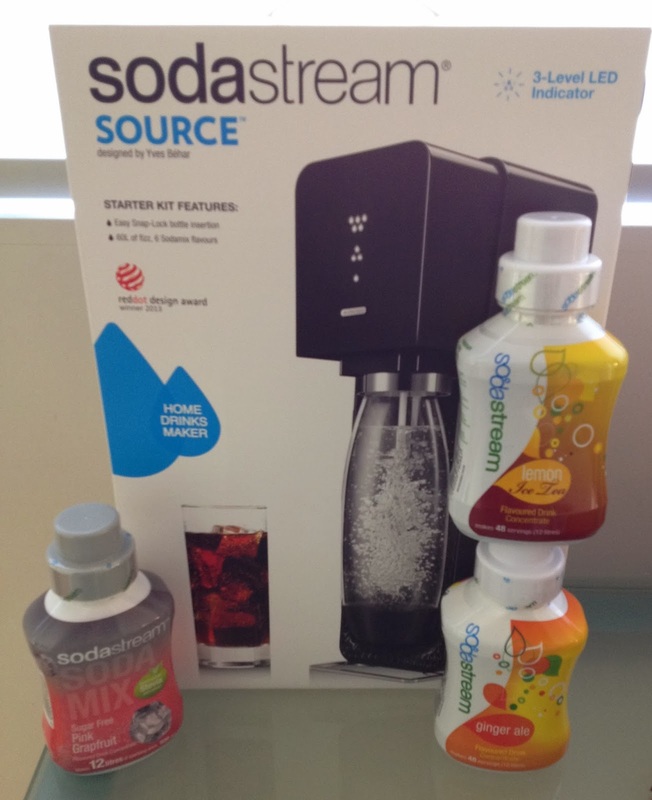 The Food Mentalist tested the SodaStream Source compliments of SodaStream Australia. Very cool appliance. I'm with you, I prefer plain mineral water with citrus. I got one for Christmas and I am loving it! I have no desire to use the syrups but have been pinteresting homemade versions like crazy. Since Christmas I have drunk a one litre bottle of the fizzy stuff a day. Love my sodastream! Definitely makes shopping easier without having to lug home all those bottles, and much better for the environment - and your wallet!